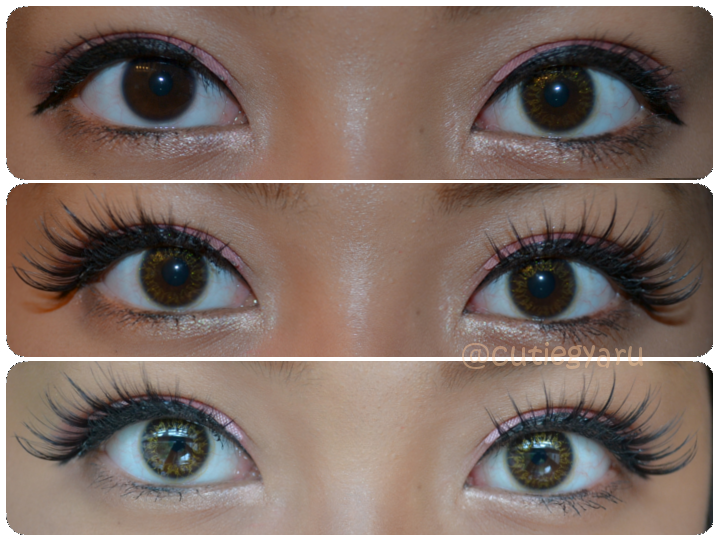 When I first saw the picture of these lens shown on the site I was super curious as to how it would look on my eyes. And also there wasn't any model photos when I first saw them too so I got even more curious. As you can see, they're just basic clear contact lens with some swirly, sparkle gold design. And with every purchase you get a cute animal case. Here are the different lightings with the lens on! Now I would say that from away there is no major notice of you wearing any sort of lens but definitely at an up close view you can see the color. This is my first time wearing any sort of lens like this one that has barely any color or flashy design!! But I think that it is so simple and almost elegant in a way that I sort of like it. The gold sparkles definitely gives a sort of radiance to your plain old eyes. I think these would be perfect for any kind of day just being lazy or going out but not trying to put that much effort. Alrighty, that's it for this part 2!! If you want to try these lens out head over to PinkyParadise! Don't forget to use my code "vickahh" to get a mystery prize from your purchase! (only one purchase necessary for code to work)And this code can be used several times, so the more chances at a different mystery prize!! See ya in the next post!! How can i join on ur lenses give aways?